GoPro Forum, Classifieds and Support > GoPro Video Software & Editing > Video Editing Software > Myk work with 7 Black? Im new to gopro, got a gopro hero 7 black for xmas. Made a few videos riding my motorcycle, but the windnoise is terrible. So i just had a look at this Myk app thing, was thinking to plug in a microphone with wind screen to my iphone 6 for better sound. Does Myk work with the 7 Black? thanks for sharing the Myk for gopro for control and audio I'll look into this for myself and see what it is about. and report back if and when i get around to this. As you read the App all the info is there, just need to try, and you can decide. hero 7 support noted on the info Do I want a watermark on my video No. so am I going to Pay, sounds like it to get the wtaermark off, etc. To record, download video, mix audio, add speedometer and place file in your photo library. Myk for GoPro turns your iPhone into a wireless microphone for your GoPro camera. Add a speedometer to your video, even if you are not holding the camera. We record the speed from your iPhone. Myk for GoPro is also a full video and camera management solution for your GoPro. 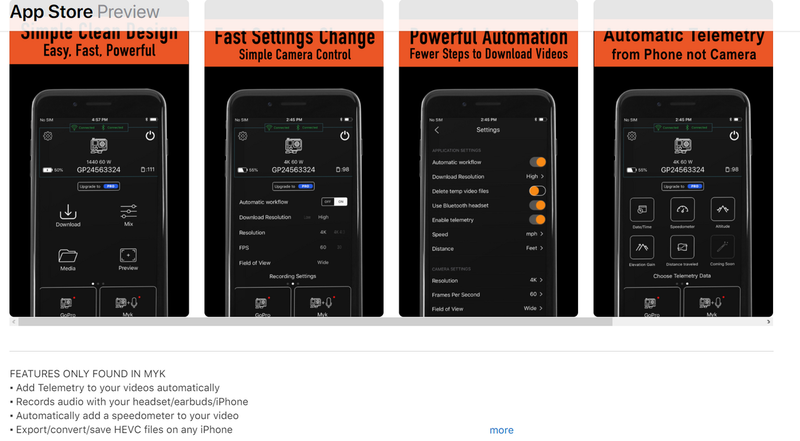 View, control, download and manage your photos and videos with the fastest, most powerful and easiest app on the market. No login or internet connection required. Simple, immediate and effective camera management with video control … plus, professional quality audio recording. Use your iPhone, or connect your favorite corded or Bluetooth headset, including AirPods and helmet mics. You can also connect Lavalier, boom, studio or any other professional microphone to your iPhone for studio-grade performance. Professional quality audio and full camera control for your GoPro HERO3*, HERO4, HERO5 or HERO6 video recordings. HEVC Compatibility. Myk is the only app that allows you to download, convert, share and play HEVC file formats for the higher definition and frame rate recordings of HERO5-6, on any version iPhone. When your GoPro records video, Myk will record audio. When finished, Myk will download a copy of the video file to the app, mix the audio and video, then place the finished file in your iPhone photo library. If you are running an iPhone 7 or below, HEVC format files will be placed in the Myk storage library so you can share or convert later. This process can be done automatically after each recording, or manually later. Your original video always stays safe on the GoPro camera. Myk requires a wifi AND Bluetooth connection (except HERO3-4). If there are any camera connection issues, they can be resolved using the Official GoPro app or visit our support site for tips. Myk is super simple to connect. Connect to the camera's wifi and Myk will do the rest. GoPro HERO Session, HERO4, HERO5 Session, HERO5 Black, HERO6 Black are supported. HERO3, HERO3+ may work depending on firmware… give it a shot! Last edited by Fish; 04-04-2019 at 06:55 AM.